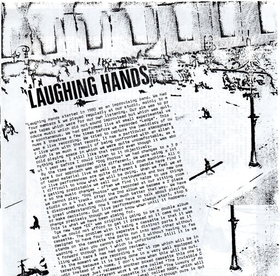 Members of Melbourne-based seminal improvising experimental group Laughing Hands and its alter ego Invisible College have been Paul Schütze, Gordon Harvey, Ian Russell and Paul Widdicombe.Their spectrally shaded instrumental post-punk-by-way-of-post-industrial constructs were effectively post rock before the genre existed. The group continued in several permutations until disbanding in 1982. They have released two vinyl albums on their own Adhesive Label (Ledge (1980) and Dog Photos (1981) plus one cassette which is part of this box EE-The Welder's Bible (1981) as well as two cassettes on the Australian tape-label Rash (Decisions) called Nights (1982) under the pseudonym of Invisible College titled The Luxury of Horns (1981/82), both also part of this box-set. While the esoteric Eno-by-way-of-Dome post punk instrumental constructs doled out across their two LP's are some of the most mesmerizing examples of this sort, their work on the tape-only releases finds them exploring a decidedly more shrouded, nocturnal and formally abstract dimension of their universe. The two tapes issued under their heading as well as the material they issued under the pseudonym The Invisible College tease out certain territories only hinted at on the vinyl releases. Nights is comprised of two side-long pieces. Side A's mesmerizing title track is filled with watery glisses, spectral synth shadings, distant metallic clatter and pained wails, while the B-side's Infinite Summer unfurls a protracted stream of stutter pulse across a vast terrain of preternatural and phantasmagoric incident. The material on EE, divided into subsections titled Vibrate, Scatter, Picture and Splinter spans the gap between Nights atmospheric abstractions and The Invisible College's more forcefully driving and art rock-ish confections, each section highlighting a facet of their cumulative praxis, Vibrate foregrounding the rhythmically forceful dimension of their aesthetic as heard on the Invisible College material, Scatter proposing a more fractured and hermetic attack that carries a whiff of Can's ethnological forgeries, Splinter exploring the more nocturnal and mechanistic side of their nature and Picture setting it's sights on the cosmos with pore-penetrating widescreen tracts of alternately shearing and suspended krautrock-ish acid sound-scaping that is perhaps the epiphanic peak of their whole discography.